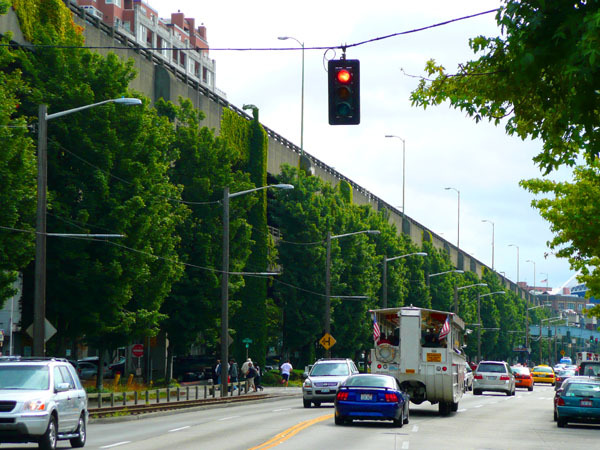 But apparently the retrofitters still have a sliver of hope: the State has agreed to let Miyamoto International — the firm who’s 2006 report bolstered support for the retrofit — to have one more look, this time including analysis of the foundation and soil conditions beneath the viaduct. But the odds would appear to be long: “We don’t expect this will change the outcome at all,” according to WSDOT’s Ron Paananen. I am so looking forward to the pandemonium that is sure to erupt in early 2009 when the Stakeholder Committee returns the only recommendation that it possibly can: a surface option. It will be a defining moment: Will the people step up and agree to do what is right, even in the face of risk and sacrifice? Or will selfishness and the short-term view rule the day? Posted by dan bertolet on	Tuesday, September 9th, 2008 at 10:19 pm. You can follow any responses to this entry through the RSS 2.0 feed. You can leave a response, or trackback from your own site. The West Seattle Blog is a group of atrocious NIMBY’s. THey’ll claim they’re not NIMBY’s yet they rally to stop every project seemingly unaware that they live amongst surface parkinglots world renown for their business honesty. I think a smaller ( than previously considered) tunnel or trenched tunnel are also very viable options at this point. The costs fall dramatically as the diameter of the tunnel decreases, so moving from 6 lanes to four lanes should result in a much lower cost than last time. The trench option allows costs to fall further because the life/safety issues are fewer with a partially covered trench than a cut and cover tunnel. Both of these options greatly reduce the through traffic into,say, Belltown, where we are trying to make more livable environments. The surface options all increase fourth avenue to five lanes and place more strain on second as well. hahaha Dorian Gray just go back up to Cap Hill. Yeah, West Seattle, Highland Park, White Center, and Southpark are real exclusive neighborhoods. Any thoughts on the surface couplet option? Besides having to move a historic structure (building where Il Bocchalino (sp?) is located)slightly to the west, and transforming an otherwise peaceful and pleasant street (Western Ave) into a street with a bit more traffic, I wonder about the potential benefits of having half the amount of cars on the waterfront, a shorter pedestrian crossing across alaska way, etc. I do not agree to all the statements you have made. But thats still “a good to read” article. merhabalar sitenizi gezerken üst tarfta hata gördüm ve bazı bölümler açılmıyor. sitniz çok güzel olmuş ancak şu hataları düzeltirsenizdaha güzel olacak.